One of the errors you might encounter when installing Service Pack 1 on Windows 7 or Windows Server 2008 comes with the error code 0x800f0818. In this post we show you how to get around this in a few easy steps. Step 1: Go to the Windows website and look for the System Update Readiness Tool for the version of Windows you are running. Step 2: After you’ve downloaded the file, run the System Update Readiness Tool installer. Step 3: Go to Windows Explorer: Start -> Computer. Then, navigate to “%systemroot%\Logs\CBS\” via the address bar. Step 4: Open CheckSUR.log with either Notepad or a similar text editor. If you see a number of fixed files at the top of the log attempt another installation of Service Pack 1. If, on the other hand, you see something under “Unavailable repair files,” you should keep reading this post. Step 6: The file name should contain the characters “KB” followed by string of digits, which tells you the update package that is corrupted. Write down that number somewhere. Step 7: Open a web browser and go to support.microsoft.com/kb/”number” (the string of digits you found and wrote down during the previous step). Step 8: You will be taken to a page where you will find the package for your version of Windows. Download the package, but don’t run the installer yet. Step 9: Extract the CAB files from the MSU installer (you can use an extraction tool like 7-Zip for this) and then extract the contents of the CAB files. You could also use the Expand –f: command line utility for this. Step 10: Among these extracted files look for the .mum and .cat files mentioned in the CheckSUR.log. Step 11: Copy the .mum and .cat files to “%windir%\Temp\CheckSUR\servicing\Packages”. Step 12: You can now attempt to run the System Update Readiness Tool installer again and check the CheckSUR.log file we’ve mentioned earlier in this process after you’re done. This time you should see that the files have been repaired. 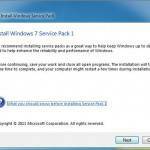 Step 13: Now you can finally install Service Pack 1 normally. Keep in mind that 7-Zip doesn’t extract files as .mum. or .cat. Also, we don’t recommend modifying files in %systemroot% or %windir% if you don’t know what you’re doing. If you’re unfamiliar with these things, perhaps it’s best you talk to an IT professional about the issue.